Researchers at the U.S. Department of Energy's Ames Laboratory have designed and built an advanced model system that successfully uses very small quantities of magnetocaloric materials to achieve refrigeration level cooling. The development marks an important step in creating new technologies to replace 100-year-old gas compression refrigeration with solid-state systems up to 30 percent more energy efficient. Called CaloriSMART™ – Small Modular Advanced Research-scale Test-station – the system was designed specifically for the rapid evaluation of materials in regenerators without a large investment in time or manufacturing. The initial test subjected a sample of gadolinium to sequential magnetic fields, causing the sample to alternate between heating up and cooling down. Using precisely timed pumps to circulate water during those heating and cooling cycles, the system demonstrated sustained cooling power of about 10 watts, with a 15 degree Celsius (just under 30° F) gradient between the hot and cold ends using only about three cubic centimeters of gadolinium. "Despite predictions we would fail because of anticipated inefficiencies and losses, we always believed it would work," said CaloriCool® project director and Ames Laboratory scientist Vitalij Pecharsky, "but we were pleasantly surprised by just how well it worked. It's a remarkable system and it performs exceptionally well. 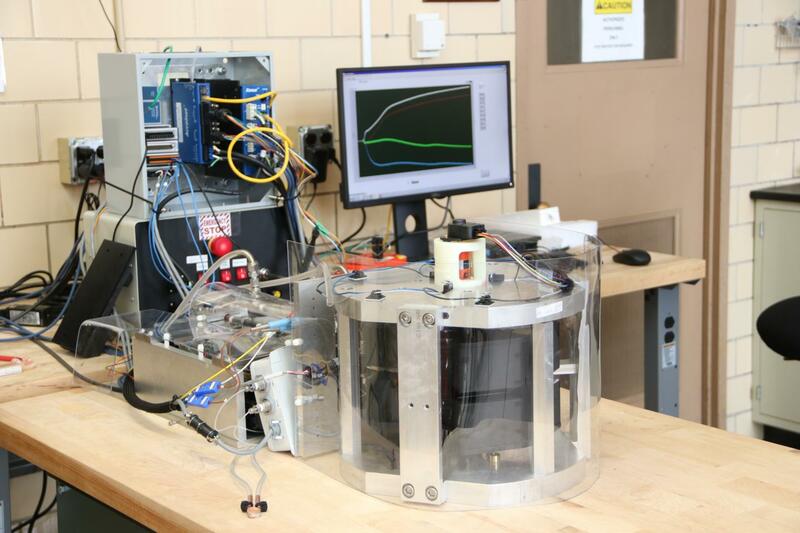 Magnetic refrigeration near room temperature has been broadly researched for 20 years, but this is one of the best systems that has been developed." Pecharsky credited project scientist Julie Slaughter and her team for designing the system that took roughly five months to build. 3D printing capabilities were used to custom-build the manifold that holds the sample and circulates the fluid that actually harnesses the system's cooling power. The system also features customized neodymium-iron-boron magnets that deliver a concentrated 1.4 Tesla magnetic field to the sample, and the precision in-line pumping system that circulates the fluid. "We only need 2-5 cubic centimeters of sample material – in most cases about 15-25 grams," Slaughter said. "We are setting the benchmark with gadolinium and we know there are other materials that will perform even better. And our system should be scalable (for commercial cooling) in the future." "But the main reason we conceived and built CaloriSMART™ is to accelerate design and development of caloric materials so they can be moved into the manufacturing space at least two to three times faster compared to the 20 or so years it typically takes today," added Pecharsky, who is also an Anston Marston Distinguished Professor in the Iowa State University Department of Materials Science and Engineering. The 3D printed manifold holding a gadolinium sample. same when subjected to changing electric field. The system will even operate in a combined-field mode that allows a combination of techniques to be used simultaneously. "There are a handful of places studying elastocaloric and electrocaloric materials, "Pecharsky said, "but nobody has all three in one place and our system now gives us that capability." CaloriSMART™ is one research thrust of CaloriCool® – The Caloric Materials Consortium. Established as part of the Energy Materials Network, CaloriCool® is sponsored by the DOE's Office of Energy Efficiency and Renewable Energy through its Advanced Manufacturing Office, and led by the Ames Laboratory at Iowa State University.